Gastroenterologist Dr. Chandra's clinical interests include colon cancer screening, biliary and pancreatic disorders including ERCPs and inflammatory disease. Professional and through! Very kind and helpful! I really like Dr Chandra for her professionalism, caring, listens to your concerns n measures she takes to resolve any issues with health concerns. Makes you feel at ease but so far all Kelsey Seybold doctors and staff are what we consider caring healthcare providers. Persistent in probelm soliving my health issues, pleasant, focus on me, listens to me, spends time with me without making me she is in a hurry. Makes herself avaiable to me at anytime. Love Brooke her nurse. Very little wait time. Dr Chandra is very friendly and makes you feel comfortable answering uncomfortable questions. 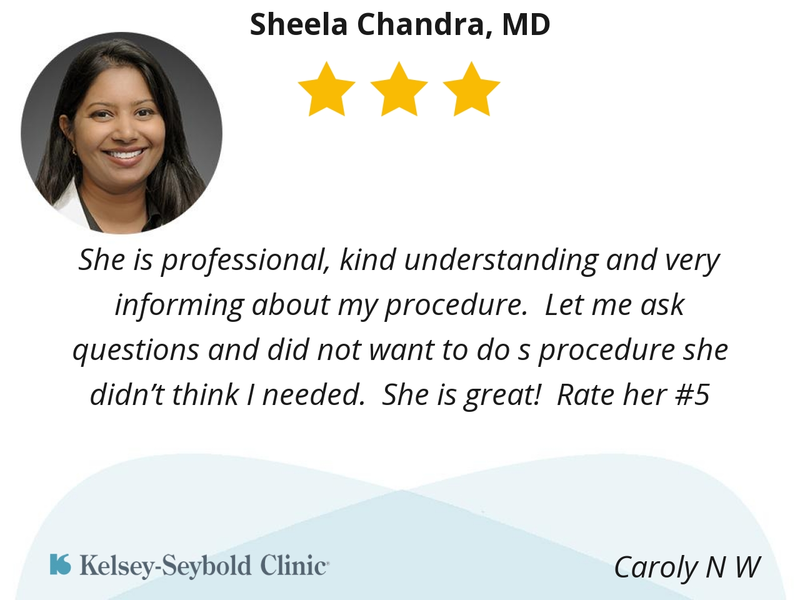 Dr. Chandra is professional and thorough. She and Brooke, her nurse, are excellent at follow up, and are always willing and able to answer any questions I have. They have been excellent at keeping me apprised of test results and options throughout the diagnostic process. She is very easy to talk to. Listen to what you have to say about your concerns. She is very down to earth and compassionate. Dr Chandra was an excellent listener, thorough and took my symptoms seriously. She did not talk down to me or dismiss my concerns about procedures and risks associated with them. She was very knowledgeable and professional and had an excellent bedside manner. I feel that I am in good hands with her. Also, her nurse Brooke was EXCELLENT in every way. She was professional, promptly returned my calls and worked me in when she could. She was not only extremely professional but also down to earth, funny and compassionate. She actually looked me in the eyes when she spoke and was very genuine during our interaction. I am really impressed with this first experience at Kelsey-Seybold. 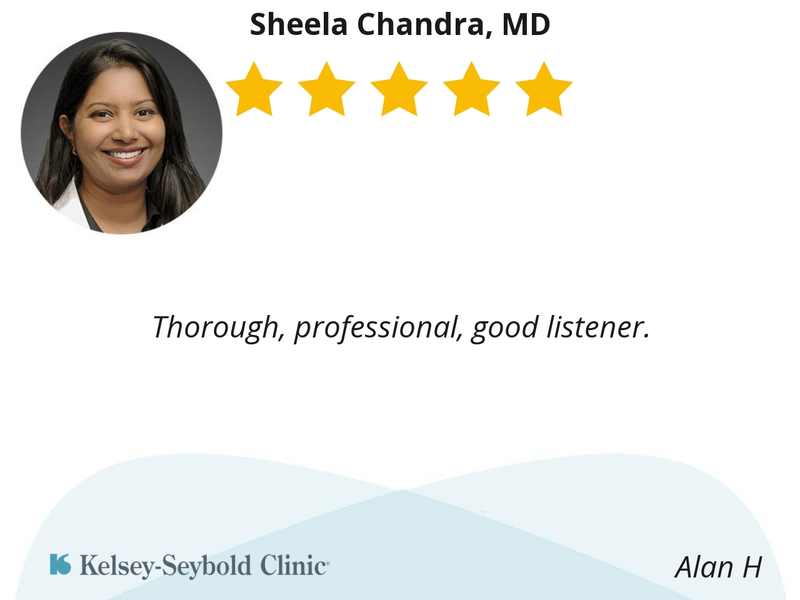 Dr Chandra was an excellent listener, thorough and took my symptoms seriously. She did not talk down to me or dismiss my concerns about procedures and risks associated with them. She was very knowledgeable and professional and had an excellent bedside manner. I feel that I am in good hands with her. Also, her nurse Brooke was EXCELLENT in every way. She was professional, promptly returned my calls and worked me in when she could. She was not only e trembly professional but also down to earth, funny and compassionate. She actually looked me in the eyes when she spoke and was very genuine during our interaction. I am really impressed with this first experience at Kelsey-Seybold. She is thoughtful and cares about my health. Always gives good advice. She makes you feel comfortable and explains everything.